Not only the „Aletsch“ but also the entire Swiss region around the Aletsch Glacier represents a part of the UNESCO World Heritage Site Jungfrau-Aletsch-Bietschhorn. Together with the Great Aletsch Glacier the biggest glacier in length and area is located in the Bernese Alps at a height of about 3,800 m (above sea level). It is located on the southern declivity of the Bernese Alps in the Switzerland, in the canton of Valais. 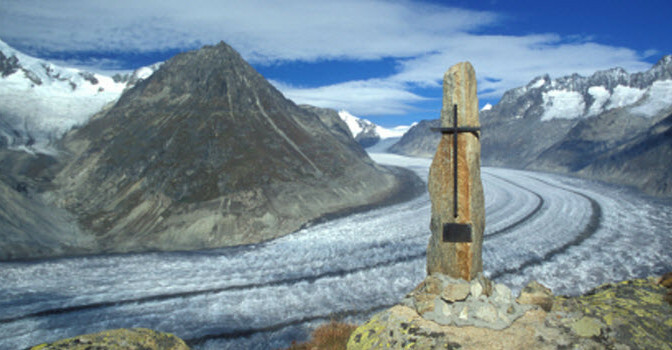 Already for a long time the Aletsch Glacier has been known as an exceptional attraction and already since 1937 it has been object of scientific studies. For more than 70 years scientists in research stations have been observing alterations of the “perpetual ice“ of the glacier. Great interest on the part of private as well as of professional scientific point of view supported the further development of tourism throughout the entire region of Jungfrau Aletsch Bietschhorn Region. The individual villages along the ridge are connected with aerial passenger tramways. You have a wonderful view of the lower part of the aletsch glacier from the villages of Riederhorn and Eggishorn. The Jungrau railway leads to the Jungfrau saddle enabling also a view of the upper part of the glacier. The village of Bettmeralp is located above the village of Betten (1,957 m above sea level). It is a high plateau above the Rhone Valley, which now as ever is accessible by aerial passenger tramway. Consequently it is car-free; however, it is not another world for tourists of the Switzerland. The infrastructure on the mountain has been adjusted according to the tourists’ needs. So there are numerous accommodations of various kinds. Next to Swiss holiday flats and guesthouses tourists can also chose their suitable place for an overnight stay from a variety of different Swiss hotels. Guesthouses and hotels are kept in proper Valais style. The inverted atmospheric conditions cause fog in the Betten Valley in winter and allow a panoramic view of this high plateau. The tourist region enables numerous leisure-time activities as for example winter sports such as cross-country skiing and alpine skiing and hiking, climbing, mountain biking as well as glacier tours in summer. Various kinds of sports are available in the village of Riederalp as well as Bettmeralp. In addition, there is the golf club with a 9-hole golf course. Riederalp can be reached by large cable car or gondola lift.